Spring Creek Dental strongly supports the use of Sealants in children to help prevent dental decay! When permanent molars erupt into the mouth, we recommend most children to have a sealant placed on the chewing (and sometimes other surfaces) of the tooth. A sealant is a thin, flowable filling that is applied into deep grooves of permanent back teeth. Without a sealant, deep grooves can be extremely difficult to keep clean with good oral hygiene, and over 75% of cavities start in these grooves. Typically, placing sealants is a very easy procedure, most often there is no need to get numb! Although sealants can do an excellent job in preventing decay, they need to be monitored and occasionally touched up or replaced over time. Our hygienists are well trained to evaluate wear and the need to replace or touch up old sealants when necessary. Children and teenagers – Typically done as soon as 6 year molars are completely erupted, then placed on 12 year molars and premolars as necessary. Typically sealants are placed on adolescents under the age of 18 years. Occasionally they are placed on adults who have a high decay risk and deep grooves. Baby teeth – Less common, but occasionally done in kids who are prone to decay and have deep grooves. Dental Sealants are easily applied by your Fort Collins dentist or dental hygienist and the process takes only a couple of minutes per tooth. 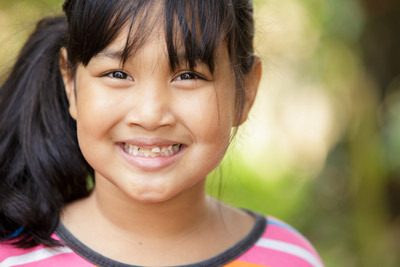 When your child needs one or more sealants, the procedure is easy. We first clean off the teeth and grooves, place cotton rolls to keep the area dry, apply an etch to further help clean and prepare the surface, then flow the material into the grooves. The material is hardened when exposed to our curing light. Next we will check the bite to make any necessary adjustments, and you’re done! Proper home care, a balanced diet, and regular dental visits will aid in the life of your new sealants. Schedule an appointment today with one of our Fort Collins dentists at Spring Creek Dental by calling (970) 482-8883.